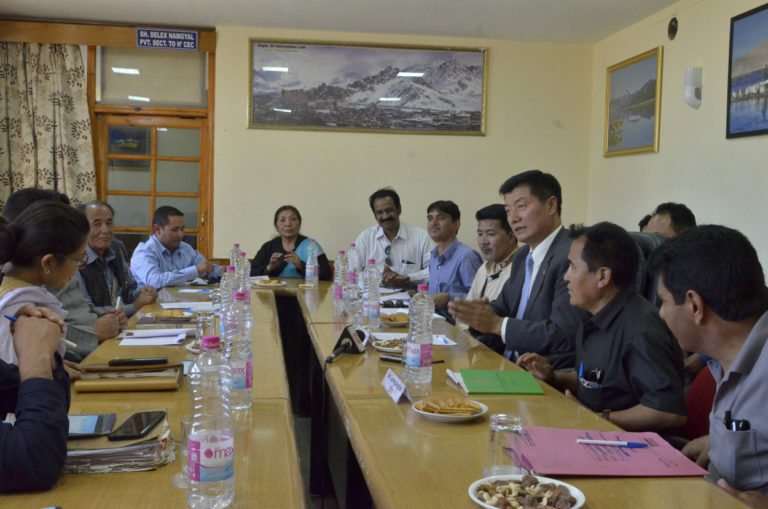 (TibetanReview.net, Jul10, 2018) – President Lobsang Sangay of the Central Tibetan Administration (CTA) has on Jul 7 met with Deputy Commissioner/ Chief Executive Officer Ms Anvy Lavasa of Leh, capital of Ladakh region of Jammu & Kashmir state of India, to discuss a range of issues faced by Tibetans living in the region. Those who took part in the meeting also included Executive Councillor Mr Gyal P Wangyal and member Mr Tsering Dorjee of the Ladakh Autonomous Hill Development Council, besides other officials. President Sangay took up 13 key challenges faced by the Tibetan community in Ladakh and requested the council for an earliest review and address of the situation, said the CTA-run Tibet.net Jul 8. Ms Avny has explained that some of the plans under a Rs 46.395 million aid fund allocated by India’s Home Ministry’s Relief and Rehabilitation Committee for development projects in the Tibetan inhabited Jhangthang region were being reviewed to ensure a sustainable development. She has added that plans under the project will be carried out once the fund is allocated to the related districts. President Sangay was stated to have referred to the surveys of the agricultural land leased to Tibetans living in Leh, Choglmasar and Agling areas of Ladakh and to have requested the earliest possible survey of land leased to nomadic Tibetans living in the Jhangthang region and for an early official sanction of the lease agreement for those Tibetans. Councillor Gyal Wangyal was stated to have pointed out that Tibetans living in Choglamsar and Leh had illegally sold land that had been leased to them to local citizens. President Sangay has assured that the CTA will set up a review committee suggested by the councillor to probe into the matter. He has also clarified that thanks to CTA’s efforts since 2011, there had been no case of illegal land sale since 2016. President Sangay has also sought rehabilitation in Leh for Tibetan nomads facing serious and unsustainable livelihood conditions in Ladakh’s Machu and Chushul areas. Ms Anvy has given assurances that the Central government’s Tibetan Rehabilitation Policy 2014 will be implemented.